That’s the motto of Koi Organisation International. So who are they? 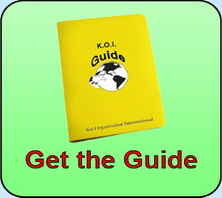 In 2009, a small group of dedicated koi hobbyists in America who were already well recognised as koi experts decided to form an Internet-based teaching organisation in order to pass on their accumulated knowledge to others. The group grew and soon invited similarly motivated and respected hobbyists from the international community to join them. A great deal of information in the public domain is unsupported personal opinion or speculation presented as fact and, over the past few years, I have discovered several of these “facts”. For example, from the forum posts of one so called expert, we are told that salt is insoluble in water and that dechlorinators aren’t necessary because he said that simply running chlorinated tap water through a hose into a waterfall will remove the chlorine before the water reaches the pond. Please don’t try this at home!! In passing on their knowledge through the K.O.I. website the team were countering such incorrect and often harmful advice with evidence based information that is rooted in established research and which is continually reviewed and updated so that it is always current and, above all, accurate. The K.O.I. website offers information in the form of free downloadable PDF’s or eBooks and there are an additional range of PDF and eBooks available at token prices of $1 to $5 (£0.65 to £3.24 / €0.89 to €4.47). Purchase via credit cards is secure and there are, as far as I’m aware, no extra charges imposed by any credit card company for transactions in GB pounds, Euros or any other currency (although the card holder should check that is still true before making the transaction). K.O.I. also invites participation in courses run over the Internet by email. There are currently 15 courses available ranging in complexity in five levels from “101 Basic Koi Keeping” up to level five; “521 - Advanced Water Quality / Koi Biology Specialist Course”. Depending on the level, these courses comprise of between two and eight assignments. Each assignment is marked by an instructor and candidates are given full mentoring support when each completed assignment is returned for marking. In this way, instructors can ascertain that the lessons, up to that point, have been understood before the candidate progresses to the following assignment. K.O.I. is a non profit organisation and the original group funded the initial outlay but there are costs associated with maintaining the organisation plus researching, verifying and creating the final products, so there is a modest fee for the courses but what they teach is invaluable. 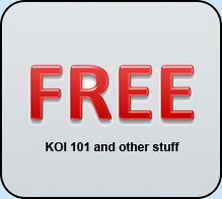 Our Level one “Basic Koi Keeping” course is free if you register (at no cost). Most of the level two courses (including my Water Quality 201 course) are priced at $25 (£16.24 / €22.36). As courses become more advanced, the cost naturally rises to reflect the amount of time that instructors will have to spend teaching and mentoring students. However no instructor gets paid, we give our time freely because we want to pass on our respective knowledge and experience to others and counter misinformation in the hobby. See the list of courses and prices. 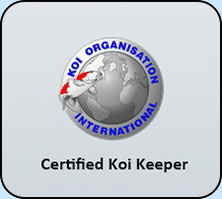 No reasonably competent koi keeper should fail Level One or Level Two courses. Level Three and Level Four courses provide successively more detailed knowledge and test the candidate’s ability to absorb and understand it. Level Five courses are only for the determined. For example; the course mentioned above, “521 - Advanced Water Quality / Koi Biology Specialist Course”, consists of eight assignments that took me six weeks of continuous intense study and background research to complete but this didn’t go unnoticed. I have now been invited to join the team to run my own water quality course which dovetails in amongst the others. I’ve had some practise in mentoring and coaching others through assignment based study. In the UK there are two such courses; the OATA Diploma Course which concentrates on general fish husbandry for the aquatic trade and there is also Duncan Griffiths’ Advanced Koi Diagnosis and Treatments Course which is aimed at teaching a detailed understanding of koi health. Having passed both of these, I’ve naturally been asked to help others complete their courses and, so far, I’ve coached three people though their OATA studies and even more through Duncan’s koi health course. I take education very seriously and there’s a fine line to draw between guiding someone towards an answer and simply telling them what it is. It’s difficult when those being helped are koi mates, but even more difficult when one is your own wife. The mates I helped appreciated my position and reasoning but my wife was a little less understanding because she is very competitive and was determined to do exceptionally well on Duncan’s course. However, I resisted the bribes and threats of divorce and my wife can now proudly say that she did earn her distinction and her 98.1% pass mark by her own efforts. Duncan has also joined K.O.I. and his health course is one of those on offer. He, the other instructors and I invite you to participate in our courses and we will do our best to pass on what we have learned over the years in our respective fields of experience.